As an end-use product, CSG is the same as natural gas, and can be utilized in all natural gas appliances and commercial applications. 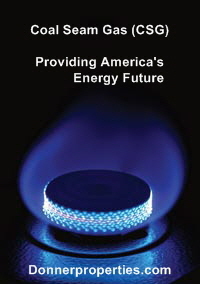 The difference between CSG and other natural gas is mostly how it occurs in nature. CSG collects in the coal seam by bonding to the surface of coal particles, whereas other natural gas is stored in the pore spaces between grains of sandstone or similar rock. 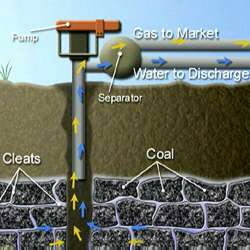 Coal seams in the ground are generally filled with water, and it is the pressure of the water that keeps the gas adsorbed as a thin film on the surface of the coal. The cleats, the fracture system of coal, may be interconnected and permeable. In a high quality CSG deposit the cleats are permeable enough to allow gas and water to flow freely through them. The level of gas produced from a coal bed is dependent on the thickness of the coal, gas content, permeability and the depth of the coal seam. The coal seams that can produce CSG economically are usually between 200m to 1,000m below the surface. Coal Seam Gas or CSG is a natural gas formed as a byproduct during the coalification process whereby organic matter is turned into coal. 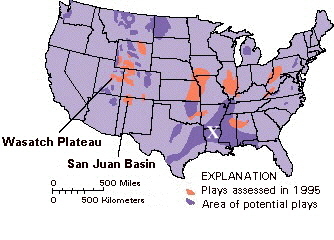 The northern portion of Louisiana holds an enormous coal resource and, therefore, potentially vast amounts of CSG. To extract the gas a hole is drilled down into the coal seam and is cased. The Coal Seam is perforated which then enables the gas to flow to the surface, where it is gathered and processed as required. See video on coal bed methane improved drilling technology here. 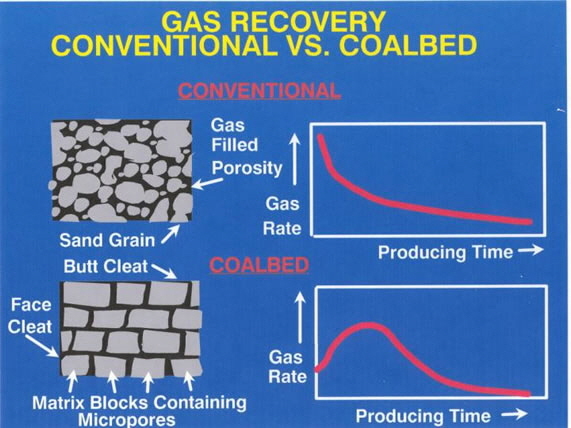 Unlike conventional natural gas reservoirs, where gas is trapped in the pores or void spaces of a rock such as sandstone or limestone, methane trapped in coal is adsorbed onto the coal surface (cleats and joints) or micropores and held in place by reservoir and (water) pressure. Hence the coal is the source and the reservoir for the methane. The micropore surface area of coal is very large, and can potentially hold significantly more methane per unit volume than most conventional reservoirs, making the Northern Louisiana coal seams an excellent source of fuel and energy. The amount of gas trapped in the coal is a function of coal rank, pressure and temperature. Coal generally has lower permeability's than conventional reservoirs so the rates of production are usually lower. In order to achieve optimal production rates, one method used is to stimulate the coal reservoirs by hydraulic fracturing. Newer drilling techniques like surface to in-seam (SIS) make fracturing unnecessary and also increase productivity. CSG is naturally an odorless gas that is used just like any other form of conventional gas to power water heaters, stoves, space heaters in both domestic and business settings and as a direct source of power for industry and as a fuel for electricity generation. Pipeline gas only has an odor due to an odorous additive that is required by law to be included for the purpose of detection. It has long been known that there are coal seams throughout North Louisiana. Back in the late 1990s, there was a flurry of interest in developing the coal seams for methane, but low gas prices and technical issues made it a marginal project at best. All of that changed in 2002 when Devon Energy and King Drilling drilled test wells in Caldwell and LaSalle parishes and made a big discovery. The result of the first tests showed that the lignite was actually a sub-bituminous coal with a high enough gas content for it to be economical. The 2002 tests led to several research projects by Clayton Breland with the Louisiana Geological Survey at Louisiana State University, Peter Warwick with the US Geological Survey and Gary Kinsland with the University of Louisiana at Lafayette.Using a supercomputer at the Lafayette university Louisiana Immersive Technologies Center, Kinsland digitized 500 well logs from across North Louisiana into a 3-D image that shows how widespread the targeted coal seams are. The information, to say the least, was impressive. According to the computer study, some of the coal seams are 30 feet thick, and it is common to find anywhere from 20 to 30 seams in a well, though some are very thin. The studies have shown that the coals in Louisiana are lignite at the surface, but at depths of 2,500 to 4,000 feet, where the natural gas is found, the coals are of a sub-bituminous grade. It was concluded by the report that the deep coals contained more natural gas per ton than is normally found in the Powder River Basin. Please contact us for more information and leasing opportunities for Coal Seam Gas in Louisiana (PDF article).